How do I remove the front panel of a Fisher Paykel DD603SS dish drawer? I’m trying to resolve an F1 error code problem. Ahh, Grasshoppah, this is one of those repair katas that’s so easy it’s sublime. The only tool you need is a pair of needle nose pliers. All is revealed in this sacred parchment from the Appliantology scriptures. F1 error codes are caused by leaks. On the DD603’s, the most common source of leaks is the drain hose– it gets little splits in it and sprays water inside the dishdrawer compartment during drain. These splits in the drain hose are usually caused by one of the white nylon drain hose support rods breaking. The drain hose itself is just a cheesy plastic corrugated tube that gets easily damaged if it gets bent too much, which is what those nylon support rods are supposed to prevent. Click the thumbnail to see the larger version of the annotated photo wherein all is revealed. 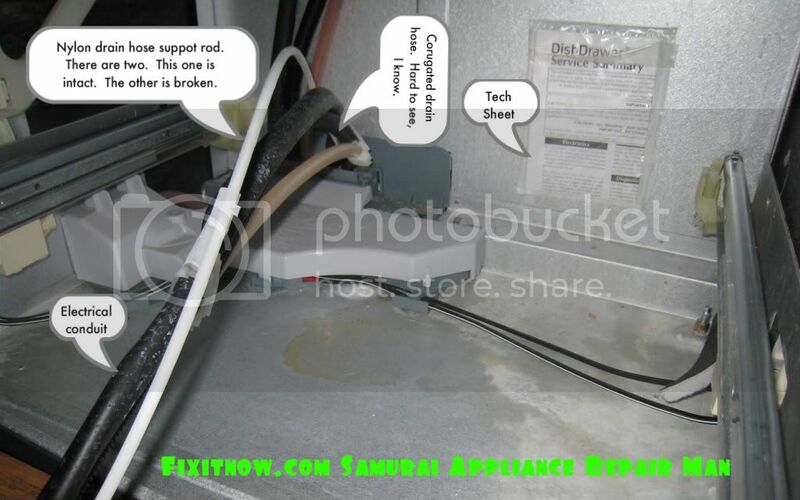 This entry was posted in Dishwasher Repair on April 12, 2009 by Samurai Appliance Repair Man.